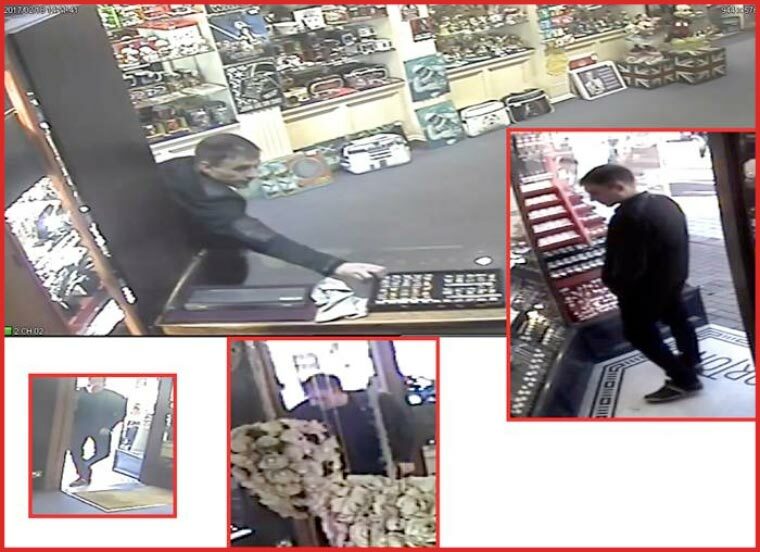 Police have released a CCTV image of a man they would like to speak to in connection with the theft of 50 gold rings worth £10,000 from a Poole jewellery store. A member of staff at Mortons Jewellers on the High Street in Poole, placed a tray of men’s gold rings on the counter top near to the front of the store and turned around to pick up another ring to put back into the tray. As he did so, a man peered around the doorway and picked up the whole tray before he made off without attempting to pay. The rings were valued at around £10,000. Police Constable Zach Dredge, of Poole police, said: “I am now able to release a CCTV image of the suspect in the hope that someone can identify him. “This appears to have been an opportunist theft and no threats were made to staff or the public during the incident. The incident happened at around 2.11pm on Saturday 18 February. Anyone with information is asked to contact Dorset Police at www.dorset.police.uk, via email 101@dorset.pnn.police.uk or by calling 101, quoting occurrence number 55170024964. Alternatively contact Crimestoppers anonymously on 0800 555111 or via www.crimestoppers-uk.org.